During the entire year of 2016, within the frames of expansion and modernization of the mobile network coverage Ucom launched new stations not only in the capital city of Armenia, but in the regions as well. The station construction works were completed and the electricity supply was provided. Thanks to all these, Ucom subscribers got an opportunity to enjoy not only better quality mobile voice services, but also use the functions of the online maps in an uninterrupted and smooth way. As a result of this year’s works, 4G+ network is now available in Yerevan, and in Yerevan subway, in particular, in the town of Tsaghkadzor, on the road and area from Yerevan to Vagharshapat, also in the area adjacent villages, in Vagharshapat, Gavar, Martuni and the adjacent villages, as well as on the roads of that very area. 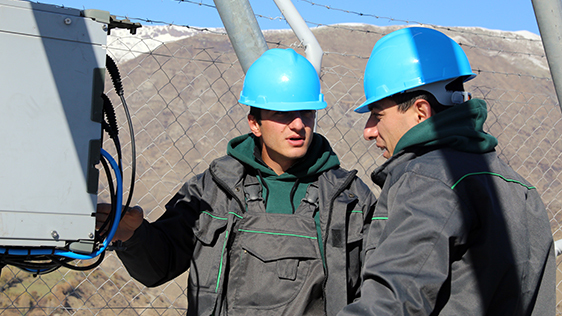 In Gegharqunik region the new network is available in Gandzak, Karmirgyugh, Sarukhan, Lanjaghbyur, Lichq, Upper Getashen, Vardashen, Astghadzor, Zolakar, Vardenik, and the adjacent villages. While in Armavir region one can benefit from the new network in Haytagh, Geghakert, Hovtamej, Arshaluys, Tsakgyugh, Artimet, Zvartnots, Paraqar, Musaler, Hayanist, Khachpar, Hovtashat, Zorak, Dashtavan and the adjacent villages. “Throughout this year including these snowy days, our technical staff kept on working at the modernization of our network and in extremely dangerous conditions at times, but all these is done to deserve our customers' satisfaction”, - said Hayk Yesayan, Director General at Ucom. 3G network was also upgraded in the region of Shirak, in particular, in the communities of Artik, Maralik, Talin, Sarnaghbyur, Musayelyan, and Hartashen. The modernization was also made in Vayots Dzor region, in the communities of Jermuk, Kechut, Hermon, Goghtanik, Arates, Karmrashen, and the intercommunity road. In the Aragatsotn region the network upgrade is complete in Aparan, Meliqgyugh, while in the region of Tavush it is done in Dilijan tunnel and along the entire road from Sevan to Dilijan.